BRYAN EATON/Staff photo. 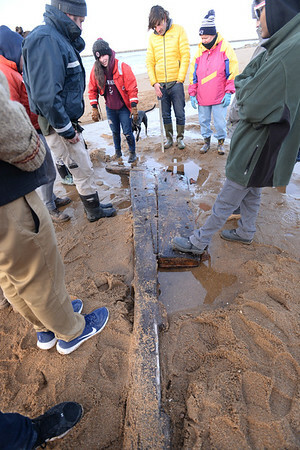 Local historian Ghlee Woodworth came across the apparent remains of an old ship while jogging along Plum Island beach just north of the south jetty of the Merrimack River. She contacted Graham McKay, executive director and master boatbuilder at Lowell's Boat Shop, center, in Amesbury to take a look. He visited the spot with some teenage apprentices to give them a look as part of their greater education of nautical vessels. He figures it's part of the deadwood stern structure from a 30-50 foot craft, likely from the latter half of the nineteenth century and either a small fishing boat, harbor craft or coastal craft.